Osborne Bulls (blue) is one of three Godolphin G1 rides for Hugh Bowman at Randwick. A week after they were in rivals in Dubai, Hugh Bowman will join forces with Godolphin in three Group One races on the opening day of The Championships at Randwick. Bowman missed last Saturday’s Tancred Stakes meeting at Rosehill to ride Brave Smash in the Al Quoz Sprint in Dubai but the Kris Lees-trained horse could only finish midfield in the race won by Godolphin’s Blue Point. “I couldn’t beat them in Dubai but what do they say, if you can’t beat them join them,” Bowman said. The champion jockey is doing just that, teaming up with Godolphin warhorse Hartnell in the $3 million Doncaster Mile (1600m), Osborne Bulls in the $2.5 million TJ Smith Stakes (1200m) and Microphone in the $1 million Sires’ Produce Stakes (1400m). 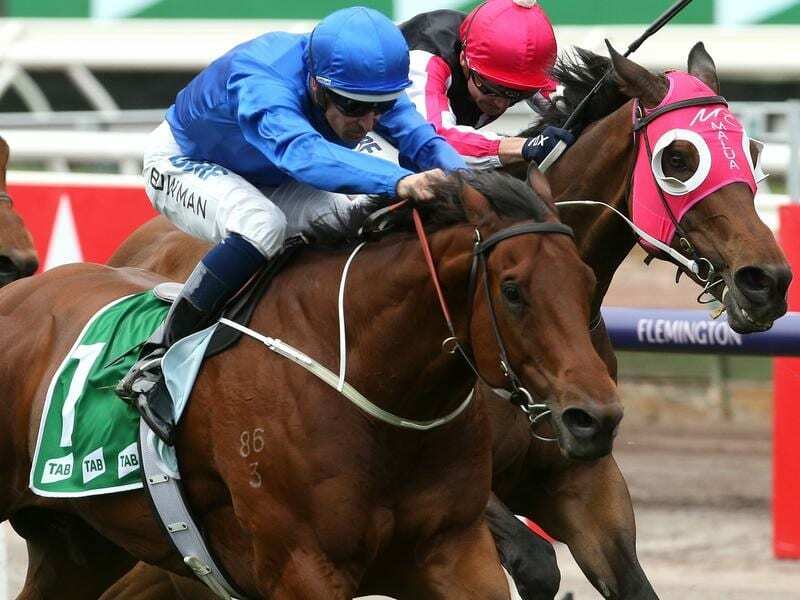 Bowman and Godolphin will be in rival corners for the Australian Derby (2400m) when Bowman partners the Robbie Laing-trained Stars Of Carrum who takes on the James Cummings-trained pair of Aramayo and Cossetot. It is an outstanding book of feature race rides and Bowman concedes his four Group One mounts all shape as genuine chances. “I’m not expecting to come home with all four but if things go our way, they all could win,” Bowman said. Osborne Bulls is the hardest in the market as the $4.60 second favourite behind Trapeze Artist. The five-year-old rocketed to prominence in the spring with an eye-catching third behind Redzel and Trapeze Artist in The Everest and has built up to Saturday’s assignment with fast-finishing seconds in the Lightning Stakes and Newmarket Handicap at Flemington. While the horse finds himself up against another quality field headed by Sunlight, Redzel and Trapeze Artist, Bowman is convinced Osborne Bulls has the makings of a Group One performer. “If you owned any one of them you’d be well within your rights to say you’ve got the best sprinter in the country and Osborne Bulls is right up there with them,” Bowman said. Along with his Group One rides, Bowman is also aboard favourite Noble Boy in the $500,000 Country Championships Final and will have a date with his favourite horse Winx when she has an exhibition gallop before the opening race.